Festive Friday Blog Hop Design 5 | Who Are You Calling Crafty? Welcome to your next stop on the Festive Friday Blog Hop. You should have just came from Cheryl Lindsay’s Blog – Cherlin – Ink. Card number five is based on my theme for my Christmas Cards this year, which is Snow. The card is my first vertical card 4 1/4” x 5 1/2” when folded and was constructed on Blue card stock made by Canson (I have had it for years!) I then added a frosted vellum to the blue Canson paper. I stamped the vellum with dye ink (navy, blue and turquoise) with the snowflake stamps. I then discovered my Blow Pens (I bought these for an art education class I had only used them once) I used them around the edges of the vellum – side note: FUN! FUN! FUN! I attached a piece of 1/4″ Metal Tape to the vellum. The metal embellishment was made from an old cereal box and covered with metal tape, I embossed the tape over the snowflake stamp before adhering it to the cardboard. I also wrote Let it Snow on the metal tape embellishment. The ribbon was given to me by my grandmother. 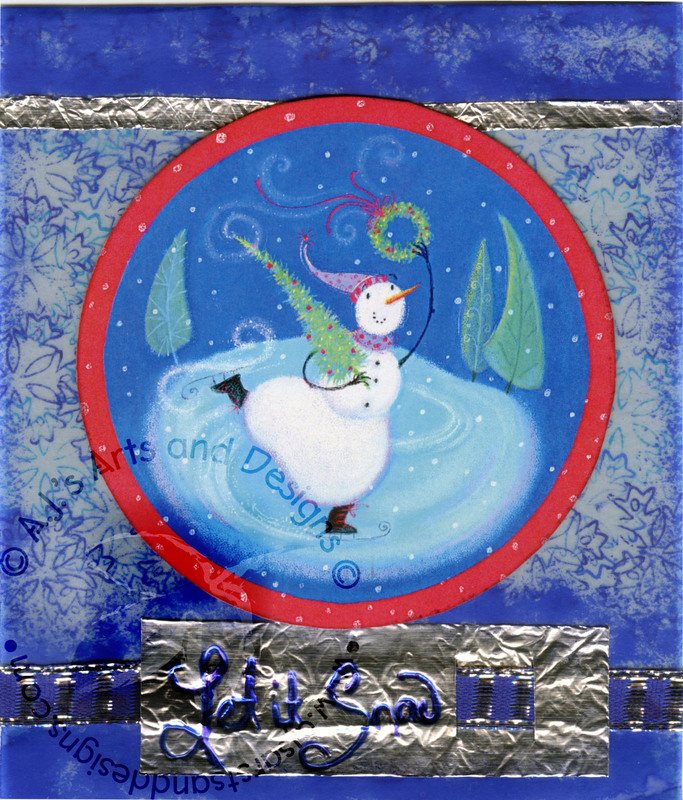 The snowman image was a Hallmark Design by Lynda Calvert-Weyant. I was given a stack of artist portfolio sheets when I was at SCAD and I never used them but I kept them. I really liked the snowman and thought it would add a little more to the card. Your snowman is great. The embossed tape is a nice accent.